In this post we will see how to configure a Cisco3850 switch for basic wireless connectivity. This is part of Converged Access product platform & you should have some familiarity with new architecture (which will not discussed in this post). Here ae the few key points you need to remember when using 3850 as WLC. 2. Wireless management vlan & AP management vlan should be identical. If you configure vlan 21 as wireless management in 3850 switch all your APs connected to this switch should be on access vlan 21. 3. You need to have Mobility Controller (MC) functionality in your network (MC functionality can be in the same 3850 switch, another 3850 switch or 5508/5760 centralized controller). By default, when you enable wireless management, switch will act as Mobility Agent (MA) & not able to register an AP without a MC since license are reside on MC. 4.“ipbase” or “ipservices” feature set to be there for MC functionality.”lanbase” cannot be used for MC functionality switch stack. 5. Given 3850 switch stack can support maximum 50 APs. In my lab setup I have two 3850 switches stacked together. Before getting started, we will ensure we will have latest software code on this switch. At the time of this write up, IOS-XE 3.2.3SE is the latest code available for this 3850 platform. You can refer 3850 IOS-XE 3.2.x SE release note for more details of the features/restrictions/etc. Let’s copy this new image to flash of our 3850. There are two modes called “INSTALL” & “BUNDLE” available in these new switches. If you want to boot in “INSTALL” mode you have to copy the image onto flash first. In “BUNDLE” mode, you can still keep the image on TFTP & boot from there if required. But in BUNDLE mode switch require more memory to do this function & preferred method is do it via “INSTALL” mode. You can use “software install file <file_location> ” command to install new software onto your switch. At the end it will prompt to reload the switch as shown below. [1 2]: Finished installing software. New software will load on reboot. Now if you look at your contents of your flash directory you will see multiple .pkg files .conf files. Depending on the image came with your switch & how many time you upgraded the switch, there could be multiple versions of the .conf files & .pkg files. You can clean this directory using “software clean” command which will result deleting all unwanted file from your directory. In this way you will only keep 3.2.3SE related files on your flash. You can verify switch is having upgraded image in each member of the switch stack. You can verify boot configuration of your switch using “show boot” CLI command. As you can see “packages.conf” file is the boot loading file used in the booting process. If this file is not exist or corrupted switch will go onto ROMMON mode. 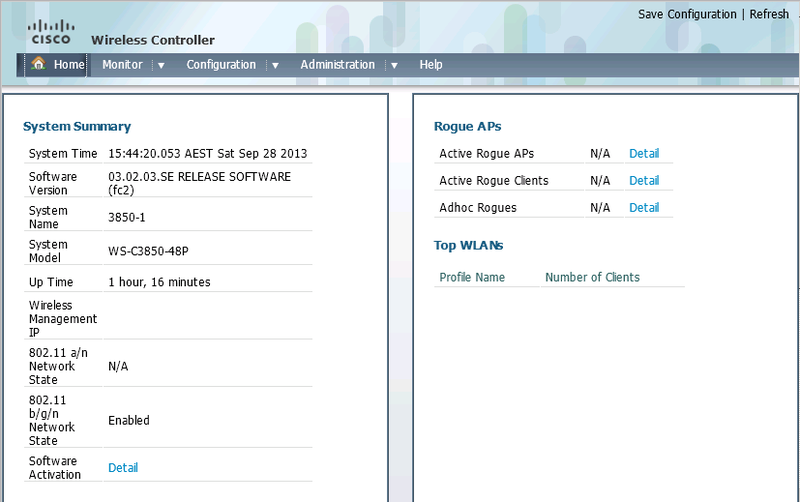 You can access wireless controller GUI using https://<switch-ipaddress>/wireless URL. It is different look & feel compare to CUWN controllers (5508,2504, etc). Let’s see how we can configure the wireless controller config on this switch. First of all you need to ensure you have the correct license to start with. default Displays the default license information. detail Displays details of all the licenses in the stack. eula Displays the EULA text. mismatch Displays mismatch license information. summary Displays consolidated stack wide license information. usage Displays the usage details of all licenses. In Converged Access architecture, 3850 can act as Mobility Agent (MA) or Mobility Controller (MC). By default it is a MA. Normally AP licence should be on a MC where CAPWAP tunnels from AP get terminated. In this case we have only 3850 switch for everything (MC & MA) so you have to install AP licence onto this switch. Remember that maximume 50 APs can be supported by a 3850 switch stack. In our case we will configure 25 licence each for the first two members of stack & all APs to be terminated in these two switches (max 25 in each member). 3850-1#license right-to-use activate apcount ? 3850-1#license right-to-use activate apcount 50 ? 3850-1#license right-to-use activate apcount 50 slot ? 3850-1#license right-to-use activate apcount 50 slot 1 ? You have to enable the MC functionality of 3850 by using the “wireless mobility controller” CLI command as shown below. You can change any AP specific configuration by using “ap name <AP-NAME> x” CLI commands. Following are the all options available. we will change the name as example. You can use “show ap name <AP_NAME> x” CLI commands to view specific AP configurations. 3850-1#show ap name L3600-1 ? If you want to configure global settings for all APs then you have to go for the configuration mode & then use “ap x ” CLI command as shown below. We will change Country code as example. You can add upto 20 country codes if you have AP in multiple countries. Next we will configure a WLAN. you can verify WLAN configuration in your “show running-config all” output. You can configure any WLAN specific configs as shown below. You have to shutdown the WLAN before make any changes. band-select          Allow|Disallow Band Select on a WLAN. load-balance         Allow|Disallow Load Balance on a WLAN. nac                  Configures Radius NAC support(Identity Service Engine). static-ip            Configures static IP client tunneling support on a WLAN. % switch-1:wcm:Request failed - WLAN in the enabled state. You can verify WLAN settings “show wlan id <WLAN_ID>” CLI command as shown below. By default WLAN is configured with WPA2/AES. So if you want to check basic client connectivity you can disable it. Then you should be able to connect your wireless client to this new SSID. In a separate post we will see how to configure different security methods for a given SSID. “You have to attach your access points directly to your 3850 switches”, – do you say it will not work if I connect my AP to another switch, and use trunk port between Cat3850 and the other swithc? Or if I do trunk port with native VLAN set as AP VLAN? If AP is connect to another switch you cannot register them to a 3850 WLC. Which mean you require 3850 in each floor (if you have comms in each floor) so you can terminate AP directly onto a 3850. If not, then you can register them to a central controller (like normal unified wireless -CAPWAP tunnel). In this case CAPWAP won’t terminate on a switch. I am really surprise to know that AP has to connect directly and also in the same VLAN. At present, we have 5508 in melbourne where all the APs from Malaysia, Brisbane, Sydney, Canberra and Hobart are registered. Of course, they are in different VLAN. Recently, I have deployed Cisco 3850 in Sydney and having plan to make that as a foreign controller and 5508 as an anchor controller, which will be providing Guest wi-fi. But, after knowing these fact, I am bit confused about the solution? Thoughts? If you want to deploy 3850 in one site as MA/MC then your AP at that site needs to directly connect to 3850 switch with same wireless mgmt vlan of that switch. User vlan can be anything, but it will be locally terminated. Thanks Rasika. By the way, awesome blog. There are plenty of things to learn from this source. Hello, we have a very problem with 3850P-W-24-S Switch, Cisco Phone 7925G and Callmanager. The 7925G Phone dont want register with the CUCM. We have 20 Cisco 2602 APs. We have tested an Autonomous AP and that work but via 3850 and 2602 not. What could be a problem with 3850? What type of authentication method (EAP /PSK?) configured for your WLAN. we have test with WPA2 AES and without Security. The 3850 have 20 APs 2602E they are in the Management VLAN 23. CAPWAP Tunnels are builded.The latest IOS is 03.03.00 on the Switch. I can post the runnng config later. number 3 I do not believe is correct. 3. You have to enable Mobility Controller (MC) functionality to terminate CAPWAP (or register AP). By default, when you enable wireless management, switch will act as Mobility Agent (MA) & not able to terminate CAPWAP. In my example, I would assume only this stack is available & no any other WLCs are there. So MC functionality has to be configure there. Hi Rasika, about that limit of 50 AP’s…was it per stack or an individual switch? It is a limitation per 3850 stack not per individual switch. Since APs are on the same subnet as wireless management interface of MA, they should be able to register using local broadcast even you do not configure Option 43, static or DNS. Yes, if code does not match AP will download image from MA prior to become operational. It is same as CUWN. I love this device, I have seen so many applications such as login with Facebook credentials and other cases that are publish on the Cisco Website, where do I find some information on how to do this kind of configuration (the facebook one); I know I need the Mobility Engine and other stuffs. I am not sure about how can do this.. sorry.. In order to activate the Controller functionality on this equipment, with the “wireless mobility controller” command. It is necesary to reboot the Switch? I need to activate this service on a CORE 3850, but can´t reload it. Yes, you have to reboot the switch. By default if you configure “wireless management interface vlan x” command switch will act as a MA. If you want to change it to MC, then you have to issue the command you provided & reboot the switch. Here is the msg you get for your reference. Mobility role changed to Mobility Controller. Please save config and reboot the whole stack. i just want to do it this way so that if the cisco 3850 fails i want AP to join Cisco 5508 controller. if possible how do I go about doing it ? Since APs need to directly connect to 3850, if you have a single stack at your branch, then APs will be down when 3850 goes down. So you won’t be able to register them to 5508. Even if you have multiple 3850 stacks at your branch (one acting as MC) & MC is down, still other APs will work in MAs. They won’t failback to 5508. So bottom line is, you can have mobility configured for guest type WLAN services, but for AP perspective you cannot register branch APs to central office 5508 in case of branch 3850 failure. I just wrote to you on another thread, yet here is the answer! Do you have a Cisco hyperlink that covers your last sentence in more detail (So bottom line is, you can have mobility configured for guest type WLAN services, but for AP perspective you cannot register branch APs to central office 5508 in case of branch 3850 failure)? In my scenario, was keen to have one (1) “5508” hosting LAPs (primary controller), then – if it falls over – (2) have all the LAPS swing to “3508” integrated controller (secondary controller) … Grateful either way to have the Cisco link so I can get the terminology correctly. If you want to terminate a CAPWAP tunnel to a 3850, then that AP has to directly connect to a 3850. In that case, if your HQ APs connect to normal switches & register to a 5508, you want able to register them to a remote 3850MC. Bottom line is you cannot use 3850 as a backup controller for existing 5508 setup. Thanks Rasika. so 3850 is pretty much not very usefull, is it ? But just out of interest is it possible to set up mobility tunnel (so would like to know) – as you do betwee ntwo 5508 controllers ? I knew that the AP have to be directly connected to the 3850 but I recently was told by a reseller that there must be a single cable between both elements. Even the use of a wall jack or wall socket would be forbidden. Did you have the chance to test that ? That’s wrong… All the time AP has to deploy via Wall socket & then patch it via a patch panel to switch. Great post Rasika, am configuring the 3850 for the first time and the documentation on cisco website is not that good (dispersed ). You have saved me a tons of time. This link might be usefull to others wanting to verify/cross refernce this posts! I’m wondering if you can use a 5760 as a MC and have your 3850’s as MA’s and also use the MC as a static mobility anchor for Guest. Since the 5760 supports multiple LAG’s you could connect one LAG into the core for wireless management, and another into the DMZ to drop off guest and cut out the requirement for a guest anchor. Do you know if a MC can also act as a static mobility anchor for MA’s that are registered to it, or does this require a mobility peer which is only MC to MC tunnel? In my actuall enviroment i’ve got a stack of 2 3850 and 4 single 3850 all are connected by 2x 10GB SFP to the Stack. On The Stack and each of te single 3850’s ive got 2 AP’s. Is there any option to manage/confígure them all only from the stack? i think not?!?! my second option is to sell an 2504 controller to manage the ap’s or is there any better/cheaper option? At the moment you do not have that option, you have to do the configs in MC (assuming this role is on 3850 stack) & all MA (single 3850s) as well. For the time being do the wireless config on each 3850. Probably in future, Cisco make some modification where you configure only in MC where config pushes to MA. I would stick to 3850s & manage this & see what’s cisco coming up within next year. at first, thanks for your fast reply, so is it a better solution to buy the 2504 wifi controller for manage the aps or what shoud be best practise sollution? As long as you configure all your 3850 for the wireless then you should be able to do this without having 2504. But if you are not comfortable with this Converged Access setup & need to get wifi setup quickly as you know (CUWN) then 2504 would help. I will get my hands on several stacks next month . I posted a question to the cisco 3850 community about the licensing. So i am not sure if you have come acros this secenario yet. So coming actually to the upgrade license to operate the wireless function. If i apply and active the MC on the master stack, i believe that there will no redundancy in the event the master stack fails. I believe that i need to order a separate license and apply this onto the 2nd stack switch so that this can take over the wifi etc.. In the event of a failure on stack 1 (master). I could not find anything useful on CCO relating to this topic yet unfortunately, so i am reaching out to you as you are considered as an helpful and clever expert that that field. Just wanted to say this is a website which I like even more than YOUTUBE! I love reading stuff in here and the easy way you explain things. there are topics which you can only find the answer for them here. wanted to say thank you again for all the time and effort. it is really a genuine source. Thanks for the complements & really helps your feedback. This is very helpful nayarasi! im new to wireless technology and 3850s. yet this blog is inspiring, and i take the challenge of deploying 50 x 3850 and 100 APs with one 8500 with no experience at all. Ü your QoS topic is also great!! …. knowledge overload!!! Firstly, Thank you for a brilliant post. I wanted to know what your thoughts are on management vlans. In our wired only infrsatrutcutre we have a management VLAN already. We want wireless now, if we use the wireless ability of the c3850 should we create another management VLAN specifically for wireless devices and keep it separate from wired management devices (e.g. other switches)… or use the existing management vlan we have in place for AP amangement and wireless management? what do you think is best? Yes, it is good to create seperate wireless management vlan. Since AP has to be on the same vlan as wireless management of the switch, typically that vlan should be DHCP & should have enough IP to cater your AP deployment. In general, your switch management may not DHCP enable & cater the capacity for the AP deployment. This is flipping awesome! I’m new to the network role more into the server infrastructure.. But I’ve been asked to take on a huge project since we are limited with help! What would you suggest I do for a new office implementation… I just ordered 2-3850-48F-E/4-wireless controller license/4=Aironet 3702i. PS-thank for such an awesome site!!! Any suggestions would greatly be appreciated! If you need to run 3702 from 3850 integrated WLC, then IOS-XE 3.6 is minimum requirement. So upgrade your switches to 3.6.1E version as that is the latest on that code train. thank YOu first for Your informational blog about 3850 with integrated WLAN. I’m also sitting in front of a new box of this type having only experience with 5508 WLCs. Please help me with a question regarding AP licencing on this device. I’m worried with the way how to activate WLAN AP licenses on this box. I expected that one have to use a activation code or license key that was bought and received from Cisco on beforehand. buying them and entering a activation code !? Cisco trust its customer & assume they will do it diligently. Great discussion. I have a 5508 as MC and several 3850 stacks as MA. Works fine. Now we are deploying a big site with many 3850 stacks. We have this time same Layer2 for all stacks on the wireless management. I see when deploying the first one that some APs not belonging to the switch (physyically) join my 3850, download software. But after they reboot they don´t seem to be able to join again. Wonder if anyone has tried this design and if it will create any problems ? I will try to add the next stack and see how this goes. Perhaps it is only a problem when the AP join first and after they got their own 3850 up and running as MA they won´t cross join stacks again. I may post my results later on if I get a conclusion. How did you go with this, I believe all 3850 directly connected AP should get registered to that MA stack. Thanks for a great blog ! Im just about to start a wireless converged access project and i have some question i hope you can help me with. Im deploying a solution with a central 5760 as MC and totally 6 3850 as MA, can i deploy all this on the same mgmt vlan ? and also the same SPG ? Can all the layer 3 interface for client vlan be attached to the Core switch in the network or do i need to configure this on the 3850 ? Do you also know of a good documentation of setting up 5760 in HA (stacking) ? If all 3850 stacks are in close by buildings where users roam frequently, then you can put all of them in same SPG. If you have layer 2 access, where all your SVI defined on core/distribution switch, then I would not define any user SVI on 3850 stacks. Simply enable DHCP snooping for those vlans on 3850 & leave SVI on distribution/core. Only SVI required on 3850 are wireless management & switch management SVI if they are two different. Otherwise simply one SVI. Also another thing, have you set up eap-tls authentication against ISE in a converged access ? Do the 5760 and 3850 support dacl ? Do i need to define both the MC and MA as a network device on the ISE ? Is there a good documentation on doing this ? I haven’t test that… probably release notes & config guides are the two thing I would refer. what could be the problem..
What version of IOS-XE runnning on your 3650 ? 1702 support is 3.7.0E onward. Use 3.7.1E as that is the latest on that code train. When I am running command sh ap summary , I am not able to get anything on MC but I can see on MA .Please advice do I have to create WLAN ID on MC ? AP details shown on MA. If you have multiple SPG where you require roaming among them then MC require to configure with WLAN same as MA. So I need to have WLAN COnfig both on MC as well as MA , The thing is that I have 2 SSID on MC and they are getting Broadcast but user is not able to see any SSID. as on MA I have only 2 Commands . i work on a wireless controler WLC 5760 which is now in ROMMON. the controler now displays , i want to donwload a new software image and boot on it. In rommon mode, the WLC allows few commands. Who ca help me please??? Hi when running 5760 as MC and 3850 as MA, do they have to be on same sw version ? No, but as a best practise I would keep the same. Thank you very much for this post. One thing is still very confusing to me when configuring a 3850 stack as a branch site’s wireless controller. At all our other branch offices we use 5508s and have a pair of 5508s in a DMZ that are used as anchor controllers for a guest wireless internet WLAN. Setting up an anchor controller is way different between the 5508s and 3850s. Can you please explain how I would configure this on a 3850 switch? if you have 3850 as MC that can be a Foreign Controller (does not support anchor controller role). Your blog is awesome and i gained a lot of knowledge from mrncciew. Thank you. Or do i need to create guest vlan in 5800 MC? also in 3850 MA? Also, does the WifiMgmt vlan for 3850, 5800-MC, 5800-GA needs to be Layer2? the GA sits in DMZ and 5800-MC sits in server farm. Appreciate your help and please keep writing. I have deployed my office wireless (Cisco 3650) using the same concept you mentioning in this article. However, the management decided to have another SSID for guest access by using the same architect we have. My existing network infra hardware are these..
My questions is, will i able to create another SSID for guest and assign them to use the DMZ by using the same architect ? Guest Anchor concept is there in CA design as well. But you need to have a dedicated controller in DMZ to do that. Otherwise you have to terminate guest traffic at your 3650 and not tunnel back to DMZ. In that case, it is just matter of creating a new SSID and map different vlan to that. Hello. I have air-cap2702i-a-k9 directly connected to 3850 gi 1/0/4. I followed your instructions but AP is still not joining in. What am I missing? What is your WLAN ID number ? What IOS-XE version you use ? I went through the forum and its very useful and it help us to understand things easily. We were trying to connect one 3702 AP with 3650 WLC and note that it will not directly connected with 3650 WLC.WLC acting as an MC. Also our setup with foreign-anchor topology. 3650 acting as a foreign controller and 2504 acting as a Anchor and its placed in DMZ Zone. 3702 AP sends the join request and download the IOS image from WLC but the registration wasn’t successful and again started with downloading process. When i checked with cisco, they were saying that 3650 wlc will support non directly attached AP. If you want register AP to 3650 MC then it has to directly connect to that switch. Only other way is you have another 3650 as MA and AP directly connect to that 3650. I faced some strange issue – I use 2×3850 in a stack, APs are working fine, the problem is – when I connect to these wi-fi APs I am unable to ssh to the switch (although it is acting as the default gateway). I know that there is an option on other WLCs to enable management via wireless, but I cannot find anything similar on 3850. I think this option was then in IOS-XE, had to dig deep to find it. Let you know if I come across soon. I’m using Denali 16.2.1 code on the 3650 and Also can not figure out why I can not SSH to my switch when connected over WIFI. When Wired it works without issues. but I’m still unable to SSH to the unit. The other issue that is bothering me is that my “PSK” password shows in clear text in the running config. Rasika I found an earlier post you had on support forms that shows a workaround using a ASCII to HEX conversion that I used as a workaround but I was hoping there was a command that can do this. I am just wondering if you had ever tried guest management with Cisco ISE on Catalyst 3650. The follow are some of the config I use but could not achieve guest management. The switch is running version Denali 16.1.2, RELEASE SOFTWARE (fc1). It has RACL and DACL define in switch and ISE respectively. The above was apply on wlan for guest. But redirection did not work. Because I am not able to lay hand on spare switch I could not test further because this current switch is in production. I need to conclude if the issues is with IOS version or the config. If you have done it before with the same IOS version then it means it is possible at least it will give me an head up. Hello from Me . I am Michael. My question is about a 3850 acting as switch and soon as wlc parallel. You say upper that the AP must be directly connected to the switch (3850). This is for the first time or the AP must stay connected on 3850 ? After the AP takes the software from the controller (3850) then can I place the AP some ware in my network and the AP belong in 3850 ‘s APs database ? I have already an 5508 In HA and recently I bought a 3850 switch and now I want to exploit the 50 license of the swich…. No, if you want to register a AP to 3850/3650, you have to directly attach AP to that switch. Indirectly connect APs are not supported in CA design. Hello and thanks for your response. There are any design that allow indirectly connection between 3850 and APs ? If you want WLC function of 3850 to be used, then it does not work. So, if want to use the 50 APs license how I can exploit these ? Is there a all-in-one combo command to view all the wireless configuration? I do know any command available in public. I am labbing up to lean Cisco ISE 1.4 and setting up my lab. *Aug 17 16:23:07.707: AP has SHA2 MIC certificate – Using SHA2 MIC certificate for DTLS. What’s the list of the compatible LWAPP access point for SW-C3850 ?